Analysis of tear film cytokines helps in studying various ocular diseases. Bead based multiplex assays are simple and sensitive and enable the testing of multiple targets in samples with small volumes. Here we describe a protocol for tear film cytokine profiling a using bead based multiplex assay. Tear film is a complex mixture of lipids, proteins and minerals which covers the external surface of the eye, thereby providing lubrication, nutrition and protection to the underlying cells. Analysis of tears is an emerging area for the identification of biomarkers for the prediction, diagnosis, and prognosis of various ocular diseases. Tears are easily accessible and their collection is non-invasive. Therefore, advancing technologies are gaining prominence for identification of multiple analytes in tears to study changes in protein or metabolite composition and its association with pathological conditions. Tear cytokines are ideal biomarkers for studying the health of the ocular surface and also help in understanding the mechanisms of different ocular surface disorders like dry eye disease and vernal conjunctivitis. Bead based multiplex assays have the capability of detecting multiple analytes in a small amount of sample with a higher sensitivity. Here we describe a standardized protocol of tear sample collection, extraction and analysis of cytokine profiling using a bead based multiplex assay. There are several studies comparing bead based multiplex assays with ELISA and have reported a correlation between the methods. Loo et al. compared bead based multiplex assay with conventional ELISA for the detection of adiponectin, resistin, leptin and ghrelin in human serum or plasma samples and reported a strong correlation (r>0.9) between the assays.25 Dupont et al. reported a strong correlation between bead based multiplex assays and ELISA for the detection of IL-1β, IL-4, IL-5, IL-6, IL-10, IFN-ϒ, and TNF-α in phytohemagglutinin and lipopolysaccharide stimulated whole blood collected from pregnant women.26 Pickering et al. reported another strong correlation between bead based multiplex assay and ELISA for the detection of serum antibodies to Haemophilus influenza type b polysaccharide (r=0.96), toxoids of Clostridium tetani (r=0.96), and Corynebacterium diphtheriae (r=0.91).27 Biagini et al. reported a high positive correlation (r=0.852) between bead based multiplex assay and ELISA for detection of Bacillus anthracis anti-PA IgG in serum samples.28 Wang et al. reported a correlation between bead based multiplex assay and ELISA for the detection of Alzheimer's disease biomarkers amyloid-β 42 (r=0.77), total tau (r=0.94), and tau phosphorylated on amino acid 181 (r=0.82) in cerebrospinal fluid samples.29 These studies have demonstrated the applicability of bead based multiplex assays on variety of clinical samples, smaller sample volume requirements and a correlation with standard ELISA, which make bead based multiplex assays a promising alternative to traditional ELISA methods for the detection of multiple analytes in different type of samples in different disease phenotypes. Here we describe a standardized protocol for bead based multiplex assay for cytokine profiling for 41 analytes in tear samples collected from healthy subjects using Schirmer strips. The protocols used in this study were approved by the Institutional review board of Tan Tock Seng Hospital, Singapore. Ask the subject to sit comfortably on an examination chair and place his/her head against the headrest. Ask the subject to open his/her eyes to remove the strip and place it in a sterile 1.5 mL microcentrifuge tube. Immediately transfer the tube to the laboratory or store at -80o C until testing for cytokine profiling. Cut the tear flow strip to a length of 0.5 cm (to standardize the quantity of tears to be tested) and place it in a sterile 1.5 mL microcentrifuge tube. Add 30 µL of assay buffer and incubate at room temperature for 5 min followed by centrifuging the tube at 14,000 x g for 1 min. Transfer the supernatant into another 1.5 mL microcentrifuge tube and discard the strip. Place the sample containing the tube on ice and use the eluted tear sample immediately for cytokine profiling. NOTE: The forty one analytes to be tested in each sample by bead based multiplex assay are interleukin (IL)-1α, IL-1β, IL-Rα, IL-2, IL-3, IL-4, IL-5, IL-6, IL-7, IL-8, IL-9, IL-10, IL-12 p40, IL-12 p70, IL-13, IL-15, IL-17A, interferon-alpha (IFN- α) 2, IFN-γ, IFN-gamma-inducible protein 10 (IP-10, CXCL10), macrophage-derived chemokine (MDC), macrophage inflammatory protein (MIP)-1α and MIP-1β, monocyte chemotactic protein (MCP)-1, MCP-3, tumor necrosis factor-alpha (TNF-α), TNF-β, growth-regulated oncogene (GRO), tumor growth factor alpha (TGF-α), vascular endothelial growth factor (VEGF), epidermal growth factor (EGF), fibroblast growth factor (FGF)-2, platelet derived growth factor (PDGF)-AA, PDGF-AB/BB, granulocyte colony-stimulating factor (G-CSF), granulocyte-macrophage colony-stimulating factor (GM-CSF), eotaxin, fractalkine, soluble CD40 ligand (sCD40L), Fms-like tyrosine kinase 3 ligand (Flt-3L) and regulated upon activation, normal T-cell expressed and secreted protein (RANTES). Bring the antibody bead solution (50X) vials to room temperature (20 - 25 oC) and vortex the vials for 1 min. 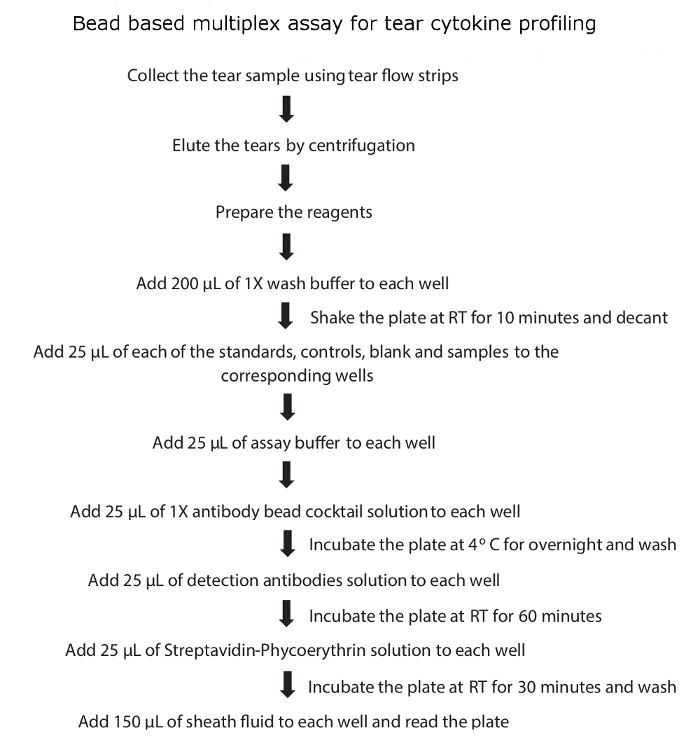 Count the number of wells required for the assay, and calculate the quantity of total antibody bead cocktail solution (25 µL per well) and each antibody bead solution (50X) required for the assay. Prepare the cocktail solution by adding the calculated amount of each antibody bead solution and fill to the desired final volume by adding the remaining amount of bead diluent. Ensure that the final concentration of each antibody in the cocktail is 1X. Always prepare at least 20% extra volume of cocktail solution in case of pipetting errors. Add 60 µL of each of the 41 antibody bead solutions (60 X 41 = 2460 µL) into a cocktail bottle and add 540 µL of bead diluent solution to the antibody bead mixture to make 3000 µL of final working solution (1X). Prior to use, mix the bead cocktail solution properly. After the assay store the remaining volume at 2-8 oC for up to 30 days. Prepare the quality controls (QC) by adding 250 µL deionized water to QC 1 and QC 2 stocks. Mix properly by inverting the bottles several times and vortex for 10 s. Transfer the solution to properly labeled polypropylene microcentrifuge tubes and store the remaining solution at -20 °C which can be used for up to 30 days. Prepare the wash buffer by adding 270 mL deionized water to 30 mL of 10X wash buffer solution and mix well (before dilution, bring the 10X buffer to room temperature and dissolve all salt precipitates by mixing). Store the unused wash buffer (1X) at 2-8 °C which can be used for up to 30 days. Prepare the human cytokine standard stock (10,000 pg/mL of all analytes) by adding 250 µL deionized water to the stock vial. Mix well by inverting several times and vortex the vial for 10 s. Allow it to stand for 10 min and transfer the stock solution to properly labeled polypropylene microcentrifuge tubes. After the assay, store the remaining solution at -20 °C, which can be used for up to 30 days. Prepare the working human cytokine standards by 5-fold serial dilutions (50 µL -> 200 µL) with assay buffer to get 2000, 400, 80, 16, and 3.2 pg/mL. After standard preparation, use the working standards within 60 min and use the assay buffer as blank/background (-pg/mL). Bring all reagents to room temperature and vortex for 5-10 seconds before adding them to the 96-well microtiter plate. If eluted tear samples are stored at -80oC prior to the assay, thaw the frozen tear extracts on ice and centrifuge at 1000 X g for 5 min. Prepare an assay work sheet in a vertical configuration for working human cytokine standards [0 (Blank), 3.2, 16, 80, 400, 2,000, and 10,000 pg/mL], QC1, QC2 and samples. Add 200 µL of 1X wash buffer to each well of the plate, seal it with plate sealer and keep it on a plate shaker at room temperature (20-25 oC) for 10 min. Decant the 1X wash buffer by inverting the plate and tap it onto absorbent towels several times to remove the any residual amount of wash buffer in the wells. Add 25 µL of each working human cytokine standard, QC1, QC2, blank (assay buffer) and samples into the appropriate wells. Add 25 µL of assay buffer into each well. Add 25 µL of 1X antibody bead cocktail solution into each well. As the antibody bead solution is light sensitive, seal the plate with plate sealer and cover it with aluminum foil to protect it from light during the assay. Incubate the plate at 4 oC overnight on a shaker. Place the plate on the plate rack of an automatic magnetic plate washer. Let it sit for 1 min to settle the magnetic beads at the bottom of the well and aspirate the well contents. Add 200 µL of wash buffer per well and let it sit for 1 min and then aspirate the well contents. Repeat the wash once again (for plate washing, follow the kit manufacturer's instructions). Add 25 µL of detection antibodies solution into each well, seal the plate, cover it with aluminum foil, and incubate at room temperature for 60 min on a shaker. Add 25 µL of Streptavidin-Phycoerythrin solution into each well, seal the plate, cover it with aluminum foil, and incubate at room temperature for 30 min on a shaker. Place the plate on a magnetic plate washer. Let it sit for 1 min and then aspirate the well contents. Add 200 µL of wash buffer per well. Let it sit for 1 min and then aspirate the well contents. Repeat the wash once again. Add 150 µL of sheath fluid to each well and place the plate on a shaker for 5 min at room temperature to resuspend the antibody beads. Read the plate immediately using the bead based multiplex assay plate reader and analyze the cytokine concentrations using a 5-parameter curve-fitting algorithm. A schematic flow diagram of tear cytokine profiling is shown in Figure 1. Switch on the bead based multiplex assay reader and pre-warm the laser for 30 min. Launch the bead based multiplex assay software. Under the 'Automated Maintenance' tab, select the 'Calibration-verification' option. Vortex each reagent vial of the calibration and verification beads for 30 s. Place 5 drops of each reagent into the designated wells. 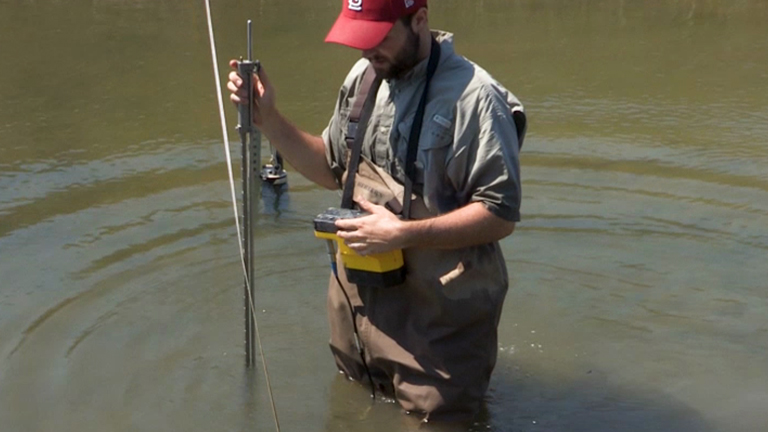 Fill the designated reservoirs with deionized water and 70% ethanol. Open the 'Protocols' page and then the 'Protocols' tab. Click "Create New Protocol"; the 'settings' tab will open. In the 'Name' box, type the name of the protocol. Type a description in the box to the right of the 'Name' box. In the 'Version' box, type the version of the protocol. In the 'Manufacturer' box, type the manufacturer information for the protocol. Define settings in the 'Acquisition Settings' section as follows. Set 'Volume': 100 µL, 'Timeout': 60 s; 'DD Gating': 8,000 to 15,000; 'Reporter Gain': Standard PMT; 'Bead type': Magnetic bead. Tick the 'Analyze results while acquiring samples' box. Click "Next"; the 'Analytes' tab opens, click on the desired analytes (bead ID) in the numbered analyte grid. Click and type the corresponding analyte name in the 'Name' column to the right of the analyte grid (analytes' names and their corresponding bead region details were mentioned in Table 1). Click and type the desired unit of measurement (i.e. pg/mL) in the 'Units' box to the left of the 'Apply All' button. Then click "Apply All". Click and type the desired bead count for each analyte (i.e. 50) in the 'Count' box. Click "Apply All". Click "Next"; the Plate Layout tab opens. Highlight the wells for the standards and select "2" under replicate count and click on the "S" Standard button. Repeat this step for the background "B" and samples "U" wells. Open the 'Protocols' page, and then the 'Standards & Controls' tab. Click "Create New Standard/Control Lots". Open the 'Select Protocol' box. Select the protocol that was created in step 1.5.3. Key in the information of the standards accordingly: Std/Ctrl kit number, Std/Ctrl kit name, expiration, and manufacturer. Key in the value of the highest standard for each analyte (i.e. 10000 pg/mL). Key in 5 under dilution and click on "Apply All" to automatically generate the expected concentrations for the rest of the standards. Open the 'Batches' page and click "Create a New Batch tab from an existing Protocol". Type the batch name in the 'Batch Name' box and type a description about the batch in the 'Enter Optional Description' box. Click on the protocol generated previously (in step 1.5.3). Click "Next"; the next tab that opens is the 'Stds & Ctrls' tab. View the details of assay standards and select "Next". On the 'Plate Layout' tab, assign well commands for this batch and click "Save" to save batch information to the 'Pending Batch' list. Load the plate into the bead based multiplex assay plate reader, shake it for 5 min and run the batch from the pending batch list. Data acquired will be saved in the .csv file format. Convert the .csv file generated from the bead based multiplex assay software to the .rbx file (results data file) format using the rbx conversion software. Launch the conversion software, select the .csv file under select xPONENT file(s) and click on the "generate" button; the .rbx file will be saved in the selected output folder. Launch the analysis software and open the .rbx file. Optimize the standard curves using the 4PL/5PL curve fit. Select the following in the 'Standard Curve' tab: 'Regression Type': 'Logistic-5PL'; 'Axis Transformation': 'Log(x) - Linear(y)'; tick the 'Show Conc Range Lines' box; tick the 'Show Unknown Samples' box; Tick the 'Show Control Samples' box; Tick the 'Apply across all analytes' box; tick the 'Show report after optimization' box. Click the "Optimize" button for auto-optimization. Label the sample identities under 'Enter Sample Info' tab. Obtain the observed concentrations in the 'Report Table' tab and click on "export report table" to generate the data in a spreadsheet file for further analysis. Out of the 41 cytokines analyzed, 31 cytokines were detected in all the tear samples, IL-17A, MIP-1β and TNF-α were detected in 7 eyes of 4 subjects, IL-4 was detected in 6 eyes of 4 subjects, IFN-γ was detected in 6 eyes of 3 subjects, IL-1A was detected in 5 eyes of 3 subjects, eotaxin and IL-9 were detected in 3 eyes of 2 subjects, IL-3 was detected in 1 eye and MIP-1α in none of the samples. The mean ± SD concentrations of 41 cytokines detected in healthy subjects using bead based multiplex assay (Figure 2) were mentioned in Table 2. Out of 41 cytokines analyzed, IL-1ra was found to be highly expressed in all the samples with the mean ± SD of 203.9 ± 52.6 ng/mL and ranged from 129.64 ng/mL to 271.7 ng/mL. Cytokines IP-10, GRO, MCP-1, PDGF-AA, Fractalkine, IL-8, EGF, PDGF-BB, VEGF and G-CSF were also highly expressed (ng/mL quantities) in the tears of healthy subjects and the remaining cytokines were expressed in pg/mL quantities (Table 2). 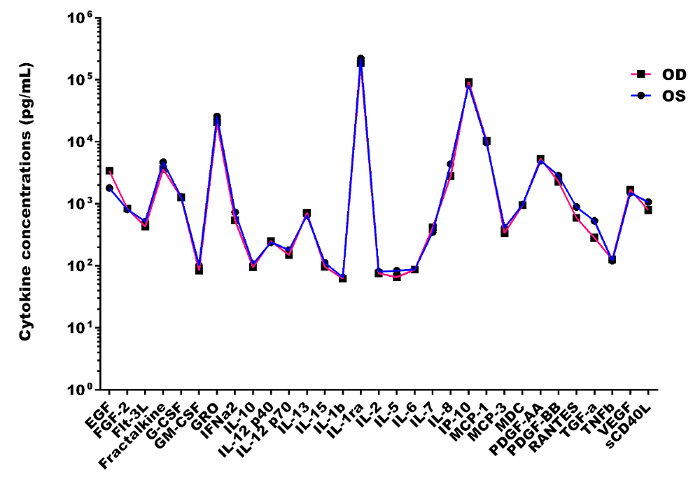 The lowest measured concentration of tear cytokine was TNF-α with the mean ± SD of 27.25 ± 19.97 pg/mL and ranged from 10.75 pg/mL to 56.02 pg/mL. In 31 cytokines which were detected in all the samples, none showed a statistically significant difference in concentration (p>0.05) between the right and left eye by t-test (Figure 3). 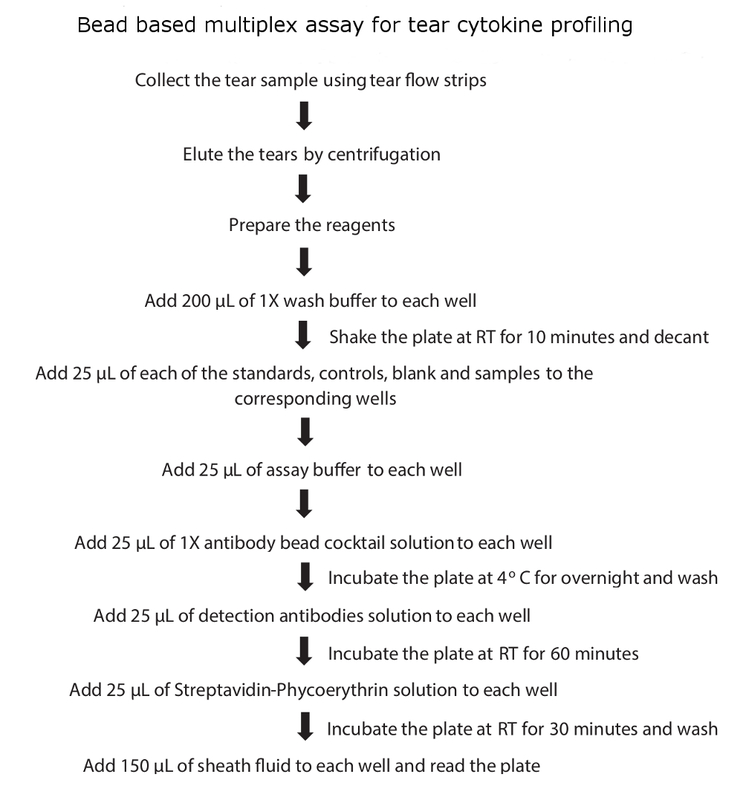 Figure 1: Schematic flow diagram of tear cytokine profiling. Please click here to view a larger version of this figure. Figure 2: Tear cytokine profiles in healthy people. Representative scatterplot showing the log mean ± SD concentrations of 41 cytokines in tear samples collected from healthy subjects. Please click here to view a larger version of this figure. Figure 3: Inter-eye tear cytokine profile differences in healthy subjects. 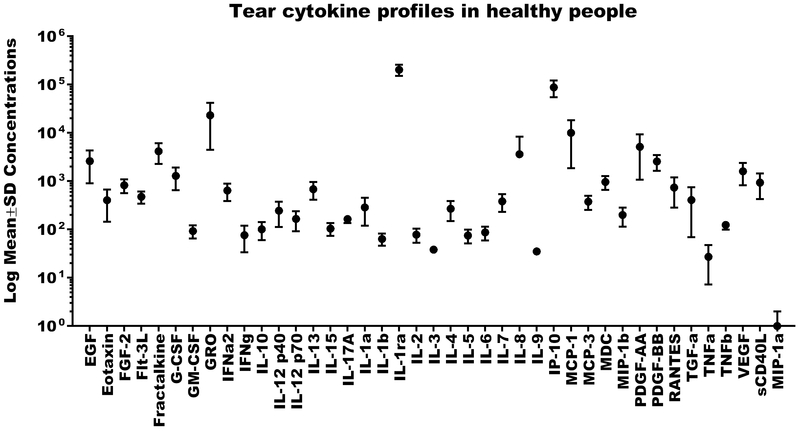 Representative scatterplot showing no statistically significant difference (p>0.05) in inter-eye mean concentrations of 31 tear cytokines in healthy subjects. Please click here to view a larger version of this figure. Table 1: Analytes' names and corresponding bead region details. Table 2: Tear cytokine profiles in healthy subjects. Mean ± SD concentrations of 41 cytokines detected in healthy subjects using bead based multiplex assay. Bead based multiplex assays are a combination of flow cytometry and multiplex ELISA in which analytes in the sample are sandwiched between the specific antibody coated and color coded magnetic beads or microspheres and biotinylated detection antibody. These complexes can be detected by adding the reporter molecule Streptavidin-Phycoerythrin (PE) conjugate and subsequent exposure to a dual laser system in a modified flow cytometry-based instrument.39 In a dual laser system, one laser excites the internal dyes and its signal represents the coated specific antibody. The second laser excites the reporting molecule PE conjugate bound to the detection antibody complex and the intensity of the signals represent the concentration of analyte. The authors have nothing to disclose. No financial interest or conflict of interest. The research work was supported by the Centre Grant from Tan Tock Seng Hospital Personalised Seed Funding Program 2015; Singapore Eye Research Institute Pilot Grant and Tan Tock Seng Hospital Pitch for Fund grant.